It is here! 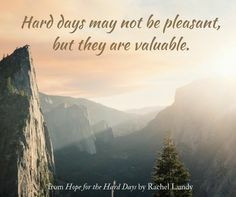 I am so excited to share Hope for the Hard Days with all of you. God has given me much encouragement and comfort through His Word, and I want to pass on that encouragement and comfort to you. I pray that you will not despair when the hard days come, but that you will cling to the hope found in Christ. 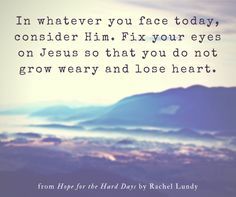 I live with a chronic illness, and there are days when I am spiritually weary from the fight and need to be reminded of the hope I have in the Lord. 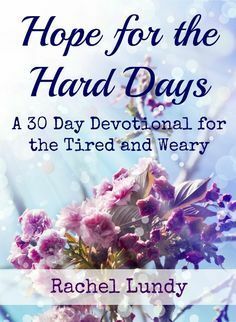 Some of the devotions in this book were written on the days when I struggled to cling to hope. I wrote the words that I needed to hear on those hard days. Perhaps they are the words you need to hear too. I had a chance to review the book prior to it's release. I can honestly tell you it is one of my favorite go-to books for the difficult moments. It's a wonderful way to start each day, and it's a perfect mid-day re-focus tool. 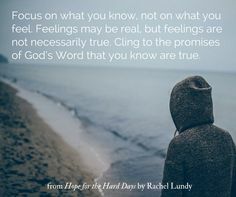 The devotionals are filled with honesty, the sweetness of scripture and the hope that is so lacking in today's world. I hope you'll download it. It's free. And it's bound to bless you. I would love to share in some of that community right here from my website. Share a post from your own blog and then simply click on the “Add your link” button below and enter your blog information. Then, please grab my Recommendation Saturday button below, and place it on your website or post, so that others can find their way to our little Saturday community! You can also Tweet your participation with the hashtag #recommendsat so that we can all find each other on Twitter! You may also join in by leaving a comment. The most important part of our community is spreading our hope and love to others by visiting some of the other inspirational sites linked up and leaving comments there. ← What Did God Write About Your Life Today? Shelly, it is so wonderful to see you back on line. I trust that you & your family are all settled after the move & doing well. You are such an encourager both in word & in the songs you share 🙂 It's always wonderful to be here! Blessings! Thank you so much for sharing about the new devotional today. Keep well and Loads of Blessings.